Anyone else with Virgin in the area? 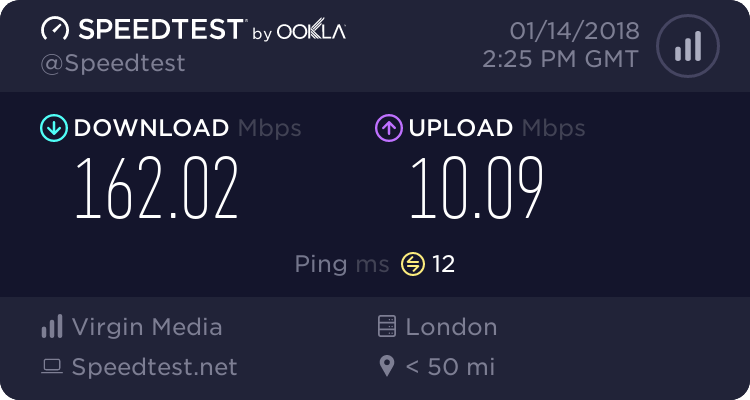 I'm on Bermondsey Street, the speeds have been so slow for a week or two (despite paying for 200mb) and constantly dropping connection. Virgin says it isn't anything but there is clearly an issue. Anyone else having problems in the area? Any other recommendations for providers? Is SE1 just a slow area? The farewell was same painful, they lied about no fibre in our area and we can't get good internet connection from other company, etc. After three weeks I gave up and switched to EE. Speed is 78/20Mbps and 5ms latency... We missed their £70 discount but got £50 with Quidco. We didn't have phone line before and 5 engineers visited us till started up the new connection but it was BT/Openreach issues. The EE customer service was brilliant, any time I called them they gave us a gift to compensate our issues: 5GB extra data to my phone, £20 discount from our first bill, etc.